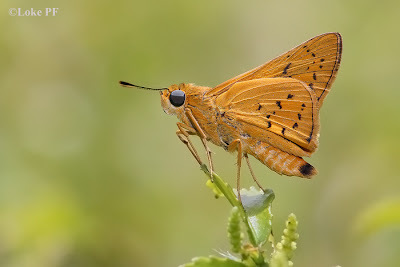 The Yellow Palm Dart is a relatively recent immigrant to Singapore and Malaysia. It is now quite widespread and found with regularity in Singapore, and in many states up north in Malaysia. This is an Indo-Australian species that found its way to SouthEast Asia probably due to human agency via the horticultural trade. This interesting pose of a Yellow Palm Dart was taken by ButterflyCircle member Loke PF. The butterfly appears to be perched quite majestically on the young shoots of a plant, surveying its surroundings, all ready to take off on its high speed flight at a moment's notice.